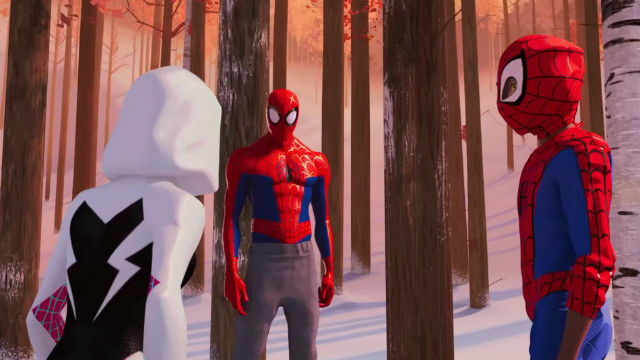 Via Fandango, Sony has released the first clip for next month’s Spider-Man: Into the Spider-Verse. Clocking in at just over two minutes, the clip highlights the mentor/mentee relationship between Miles Morales and Peter Parker. You can check out this latest offering via Twitter below. The clip shows Peter and Miles escaping from a laboratory after stealing a briefcase. Upon closer inspection of the case, the lab seems to be the headquarters of Alchemax. Comic fans will recognize this as the mega corporation that employs Miguel O’Hara, a.k.a. Spider-Man 2099. None of the trailers for Into the Spider-Verse have indicated that Miguel will play a part in the film’s story. However, the inclusion of Alchemax could potentially set up a role for him in a future installment. The botched heist prompts Peter to give Miles his first web swinging lesson, albeit under less-than-ideal conditions. Dressed in a cheap imitation of Peter’s costume, Miles struggles at first to match the OG Spidey’s graceful movements. But as they continue to evade the armed scientists, he proves himself to be a fast learner, following Peter’s instructions to “aim with your hips.” The chase through the snow-covered forest also culminates in the pair’s first meeting with Gwen Stacy / Spider-Gwen. Or Spider-Woman / Ghost-Spider, if you prefer. The animation, which includes the word “thwip” actually showing up onscreen, once again makes the film feel like a living, breathing comic book. Earlier this week, it was revealed that Sony is already planning two more entries in the Into the Spider-Verse franchise. Since the film currently holds an impressive 100% rating on Rotten Tomatoes, it’s safe to say the studio didn’t jump the gun this time around. Spider-Man: Into the Spider-Verse swings into theaters on December 14. You can share your thoughts on the new clip in the comment section below!